In Japan, dutifulness is extolled in many forms. Filial piety is the virtue of a child to his or her parents or parental figures, both living and deceased. It is one of the most fundamental virtues universally found in diverse cultures throughout human history. In Confucian thought, filial piety (Chinese: 孝; pinyin: Xiào) is one of the virtues to be cultivated and denotes a love and respect for one's parents and ancestors. In Western cultures, Judaism and Christianity both assert the importance of honoring and respecting one's parents. In the Hebrew and Christian traditions, filial piety is asserted in various instances of the Bible. For example, the fifth commandment says to "Honor your father and your mother" (Exodus 20:12), and the relationship with God as a Father denotes a relationship of love and respect. A classic example of filial piety in the bible can be found in the relationship between Isaac and Abraham, a story that exemplifies the values of obedience and piety beyond any concern for one's own well-being. Filial piety is considered the first virtue in Chinese culture, and it is the main concern of a large number of stories, for example The Twenty-four Filial Exemplars (二十四孝). This story depicts how children have exercised their filial piety in the past. Throughout most of the diverse religions of China, filial piety has been common to almost all of them. For example, Historian Hugh D.R. Baker calls respect for the family the only element common to almost all Chinese believers. These traditions were sometimes enforced by law, during parts of the Han Dynasty for example, and those who neglected ancestor worship could even be subject to corporal punishment. For Confucius, xiào was not merely blind loyalty to one's parents. More important than the norms of xiào were the norms of rén (仁) (benevolence) and yì (義) (righteousness). In fact, for Confucius and Mencius, xiào was a display of rén which was ideally applied in one's dealings with all elders, thus making it a general norm of intergenerational relations. In reality, however, xiào was usually reserved for one's own parents and grandparents, and was often elevated above the notions of rén and yì. One of the important texts about filial piety in Confucianism is Xiao Jing (孝經; alternative transliteration: Hsiao Ching), the Book of Filial Piety. Although early Indian culture had elements of filial piety, early Indian Buddhism did not have a specific notion of filial piety. Early Buddhism in India rejected respect for ancestors and parents because the true Buddhist had to reject all family ties, just as they had to reject social and class ties if they were to pursue Nirvana. Early Buddhism stressed individual salvation, and had little room for the interdependent society that Confucianism had created in China, which stressed the good of the community more than the good of the individual. In India, Buddhism also advocated celibacy among its monks which was unacceptable in the Confucian world view, given that it was viewed as the child's duty to continue the parental line. When Buddhism was introduced to China, it was redefined to support filial piety. The Mouzi Lihuolun (牟子理惑論), a work defending Buddhism to the Chinese, presented arguments for Buddhist monks' seemingly poor treatment of their parents, by closely reading the works of Confucius himself. The Mouzi Lihuolun compares the Buddhist monk to a son who saves his father from drowning by grabbing him and lifting him upside down back into the boat. Grabbing and holding one's parents upside down is certainly not standard conduct, but because it is for the greater good of the parent, it should be allowed. If he had not violated rules of respectfulness, his father would have drowned. Confucius allowed for these "emergencies" by insisting that filial piety must adapt to existing circumstances. The behavior of a Buddhist monk is similar. While on the surface the Buddhist seems to reject and abandon his parents, the pious Buddhist is actually aiding his parents as well as himself on their path towards salvation. The Mouzi Lihuolun also attempted to counter charges that not having children was a violation of good ethics. It was pointed out that Confucius himself had praised a number of ascetic sages who had not had children or family, but because of their wisdom and sacrifice were still perceived as ethical by Confucius. The argument that Buddhist filial piety concerns itself with the parent’s soul is the most important one. The same essential argument was made later by Sun Ch'o, who argued that Buddhists monks (far from working solely for their own benefit) were working to ensure the salvation of all people and aiding their family by doing so. 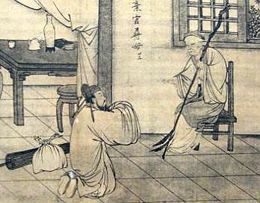 Hiuyuan continued in this reasoning, arguing that if one member leaves the household to be a monk, then all other members of the family would benefit from good fortune and lead superior lives. These philosophical arguments were not entirely successful in convincing the filial Chinese that the behavior advocated by Buddhism was correct, and so less subtle methods were employed. To more directly give Buddhism a filial nature, passages and parables that were of minor importance in Indian and Central Asian Buddhism became very prominent in Chinese Buddhism. The story of Shan-tzǔ (Syama in Sanskrit), is an example of this. Shan-tzǔ spent his entire life aiding his blind parents, until he was accidentally killed. But, because of his life of filial devotion, he was miraculously revived. This story was often mentioned in the Chinese canon of Buddhist writings, including in a number of different anthologies (such as the Liudu Jijing) and referred to by other Chinese Buddhist writers. While it is clearly of Indian origin, this tale was virtually indistinguishable from similar Chinese tales. While the tale was transmitted along with Buddhist writings, philosophically it had very little to do with traditional Buddhism. 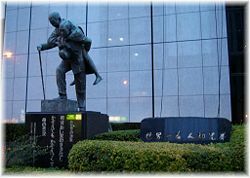 Another story advocating filial piety is that of Moggallana, a Buddhist monk who goes to great lengths to rescue his mother from condemnation for her unjust life. This story appeared in the Ullambana Sutra and it is far more relevant to Buddhism than the tale of Shan-tzǔ, though it was still not a particularly important tale in Indian Buddhism. In China, however, these stories became not just elements of Buddhist scripture, but also popular tales which were even told amongst non-Buddhists. While these tales were a part of the Buddhist tradition, Chinese Buddhism raised them from a peripheral role to a central one. Another tale that rose to great prominence in China was that of the Buddha rising to heaven for three months after his Enlightenment to preach and teach to his mother his new philosophy. This tale was used to indicate that the Buddha did indeed show proper concern and respect for his parents, in that he cared for their immortal souls. A number of apocryphal texts were also written that spoke of the Buddha's respect for his parents, and the parent-child relationship. The most important of these, the Sutra on the Weighty Grace of Parents, was written early in the T'ang dynasty. This Sutra has the Buddha making the very Confucian argument that parents made great sacrifices, and put great efforts into ensuring the well-being of their child. In return each child must repay this kindness with loyalty and respect. Despite being a forgery the sutra was accepted as accurate by generations of scholars and commoners, and it played an important role in the development of a fully Chinese variation of Buddhism. Other documents discussing the Buddha’s views on the parent-child relationship were also probably forgeries. The Sutra on a Filial Son, for instance, also sounds far more Chinese than Indian, and shows Confucianist influence. Radice, Thomas. The Ways of Filial Piety in Early China. Thesis (Ph.D.)—University of Pennsylvania, 2006. This page was last modified on 10 April 2017, at 17:54.